A representative figure of the Mediterranean environment, the olive tree is a peace and life symbol. The hills and orchards covered with centuries old olive trees create Drome's department panoramic views between Les Baronnies and Noyons. 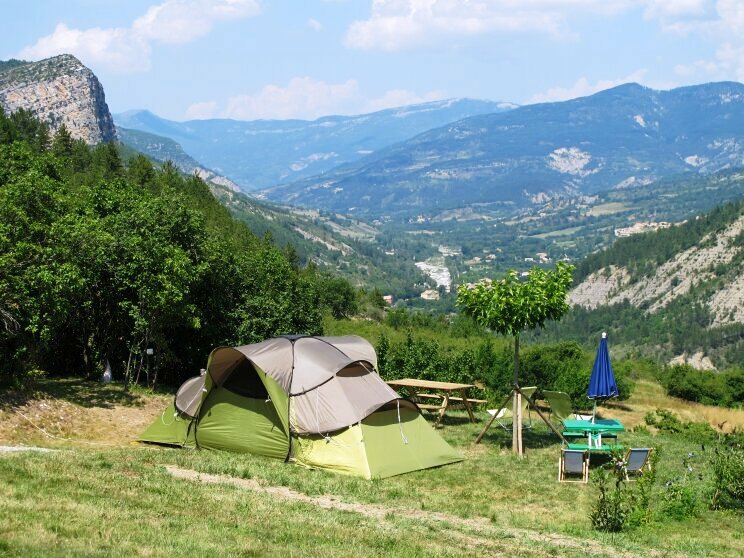 It creates just the perfect setting for a camping holiday break in Noyons, in Drome provençale. Nyons black olive, named Tanche, was the first variety to have aquired a Controlled Appellation of Origin lable in 1994 and then a Protected Appellation of Origin label in 1997. Nyons' olive oil also has the same labels now. In the traditions of the old days, ten mills extract and distill the unique oil with subtle and smooth flavours. Located between Provence and Dauphiné, Nyons appellation territory is limited by Mont Ventoux and Baronnies Provençales, Lance mountain and Mont du Pied-de-Vaux, Pre-Alps and Rhone plain. Thanks to a microclimate, Nyons olive has a unique fruity taste which explains its quality and fame. "The black pearl" has been praised by food lovers and gastronomers for many generations now! Afidol (Association Française Interprofessionnelle de l’Olive - French Association of Olive Professionals ) invites you to olive oil tastings all year long. Perched on the hills of Rémuzat, the farm of La Perrière offers an exceptional panoramic view on the valleys of l'Aygues and l'Oule. The campground has 6 places, toilets and bathroom with heated water, swimming-pool... Welcome at the farm! For a weekend or a stay in our campsite, chalet, mobil-home or holiday cottage, come rest and relax, we'll do our best to make your stay enjoyable. Facing the mount Ventoux, in beautiful setting of the Drôme Provençale region, the "Orée de Provence" welcomes you in a large natural site. Perfect place for hikers, or to rest and relax. Come and discover this camp site in the heart of the Baronnies. The Domaine de la Chamarade offers you pure moments of wellbeing, far away from your stressful life! On this shaded site, you will be able to buy and rent bungalows for 2 to 8 people. Le Chambron is located at Condorcet at the foot of the Castle of "Marquis de Caritat". Condorcet is a charming little village of 450 inhabitants situated in Drôme Provençale.